Burnley: How did Sean Dyche secure Premier League football? Burnley, one of the grand old names of English football, are back in the big time. Monday's victory over Lancashire rivals Wigan - themselves a Premier League club only 12 months ago - guaranteed automatic promotion for the Clarets and ended their four-year absence from the top division. BBC Sport assesses the main reasons for their unexpected success and their plans for life as a top-flight club. Burnley appointed Sean Dyche as their new manager in October 2012, following Eddie Howe's return to Bournemouth. Many felt Dyche had been treated harshly by former club Watford, who had terminated his contract four months earlier despite him leading the Hornets to their highest league finish in four seasons. How many managers would come in and give a PowerPoint presentation to the board? Do not be fooled by the gravelly voice, the shaven head or the 460 league appearances as a tough-tackling centre-back. The 42-year-old likes high-quality and high-energy passing football. He also has an astonishing attention to detail, as co-chairmen John Banaszkiewicz and Mike Garlick discovered when they interviewed Dyche for the manager's job. "He actually brought a powerpoint presentation for us," said Banaszkiewicz. "How many managers would come in and give a powerpoint presentation to the board of Burnley?" Dyche recalled: "It was something to give them a feel of what I was about, the depth of how I work and how the staff should work, and what I felt would be important for the club. Thankfully it was enough for them to decide that I was their man." Core values are also hugely important to him. Dyche spent time with Oxford's Boat Race crew while studying for his Uefa Pro Licence qualification and was impressed with the pride, dedication and unity of the group - all qualities he has implemented successfully at Turf Moor. Dyche's highlight of the season? "Seeing a group of players develop into a real team. There are lots of good individuals at any given club, but the reality of a team is working within each other's strengths and weaknesses, finding that balance and believing in each other. "And we've taken away any ego. We all have one and they can get in the way of things." Burnley sold star striker Charlie Austin to QPR for around £4m in August and acquired goalkeeper Tom Heaton, plus midfielders David Jones and Scott Arfield, on free transfers. All three have been regular starters this season. Striker Ashley Barnes joined from Brighton in January for a undisclosed fee, reported to be in the region of £750,000. Other Championship clubs such as Blackburn,Bolton and QPR have posted significant financial losses in pursuit of Premier League football. But the policy at Burnley is simple. "We're running this club in a proper way," said Banaszkiewicz. "If you haven't got lots of money, you have to be careful with it." But it has not been easy for the Turf Moor club, who took time to recover from losing their top-flight status in 2010. They announced an annual loss of £8m in August, but Garlick revealed the club hope to "scrape a very small profit" for the subsequent six months. "At Burnley we often have to make the best of what we've got, polish the diamonds and make them shine," he said. "A lot of managers just want the money and instant success. Sean's got patience and can develop players. That's the sort of person we need in charge." Dyche added: "You're a custodian, not just a manager. This club has got a rich history and it is one that has to be protected. It has to be moved forward but in the correct manner. "A lot of managers throw the board under the bus as soon as any trouble comes. It's not my style. The club's more important than me and I'm the custodian of that club." After Austin's departure to QPR, where would the goals come from? Even the most optimistic of Burnley supporters would have struggled to envisage the strike partnership of Sam Vokes and Danny Ings being so successful. Wales international Vokes endured a nomadic existence after helping Wolves to the Championship title in 2009. The 24-year-old had loan spells at six clubs, including Burnley, before moving to Turf Moor permanently in 2012. This season has been by far his best in terms of goals, with Vokes scoring 20 times in the league before a serious knee injury curtailed his campaign in March. If anything, Ings has enjoyed more plaudits than his strike partner during Burnley's promotion push. The 21-year-old finally made his breakthrough after two injury-affected seasons at the club and he has also passed the 20-goal mark, earning him the Championship's player of the year award and international recognition with England's Under-21 side. 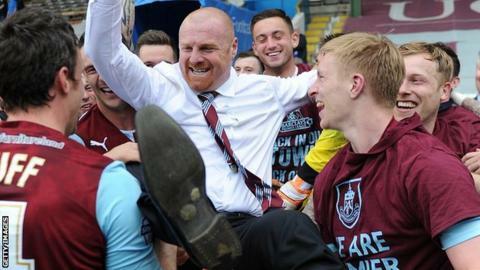 Dyche came in for some criticism last season when he suggested a section of Burnley fans needed to be more realistic with their expectations, a comment he does not regret. "It takes time," he said. "Everyone wants something instantly and it's just the way it is now, in life and in football. Burnley went for more than a year without losing a home game in the Championship. The 2-0 loss to Leicester on 29 March was their first since a 1-0 defeat by Hull 383 days earlier. "I know the demands are high. I was suggesting then that there was good work in progress. I felt there was good work behind the scenes and we were making changes that I thought could benefit the team and the club for the future." Losing Austin on the eve of the season could have had a negative effect. Instead, it galvanised the whole club, as did a promising start to the campaign. And Dyche believes the fans deserve credit for their role in Burnley's promotion. "I never guaranteed that we would win every week," he continued. "I guaranteed the fans they would see a group of people that would give everything for the club. "If you're in any workplace and someone keeps berating you, it's fair to say your performance would go down. If fans have a patience level, which is tough sometimes if things aren't going well, it does help the players. "I thank the patience of the fans and it's invaluable for the players to feel the stadium is calm. "The home game with Leeds [in March] was a great example. We were 1-0 down and there wasn't a sound of anything negative. You could almost sense the fans thinking 'they'll do it, they'll get back in'. The players respect that greatly." Burnley's last experience of the Premier League in 2009-10 was not a happy one. It began brightly enough for Owen Coyle's side, who won five of their first six home games and defeated reigning champions Manchester United. Danny Ings, Sam Vokes and captain Jason Shackell all scored as Burnley made it 10 points from their first five Championship matches. Victory over title favourites QPR proved their status as promotion contenders. Former Clarets striker Charlie Austin was blunted on his return to Turf Moor and Ings scored twice to send the Clarets three points clear at the top of the table. Derby would have climbed above Burnley and into second place with a win, but goals from David Jones and Dean Marney created a five-point gap between the Clarets and the chasing pack. A win worth much more than just three points. Burnley came from behind to beat Lancashire rivals Blackburn for the first time since April 1979. Inevitably, top scorer Ings netted the winner. First-half goals from Ashley Barnes and Michael Kightly seal Burnley's return to the Premier League for the first time in four years as they beat their Lancashire rivals at Turf Moor. But their form dipped alarmingly, Coyle left for rivals Bolton in January, Brian Laws came in as his replacement and the Clarets finished five points adrift of safety. Burnley are almost certain to be one of the favourites to be relegated, but do not expect an influx of new players at Turf Moor. Could the current squad compete in the top flight? "There's a gap now between the Premier League and the Championship," acknowledges Dyche. "It's just because the resources are incredible and players are available from all over the world. "That being said, I do value a real team. A real team can be very productive at any level of football. I do look at some Premier League sides and wonder if they have a real team ethic. I'm not suggesting that's enough, but it doesn't half give you a good chance." Off the field, Burnley are keen to build for the future. "It's very important that we invest in the right things," said Banaszkiewicz. "The academy, the youth structure and the training facilities - we need to upgrade them. We've done a really good job so far but we need to go up a level from there. "We will look at investing in that type of infrastructure because that's the future and that's how we can get good young players to come and play for Burnley." Looking a little further ahead, where will Burnley be in five years' time? "The key thing is that we have a football club, that we're solvent, that we're part of the community and that people value it. That's the number one objective," said Garlick. "If we can go on and get promotions and things like that, that's all fantastic. That will only help the club going forward." Interviews by BBC Radio Lancashire's Scott Read.